RIT Students and Universidad Autónoma De Occidente Professor Alvaro Rojas set up the solar-powered 3D printer for a demonstration. 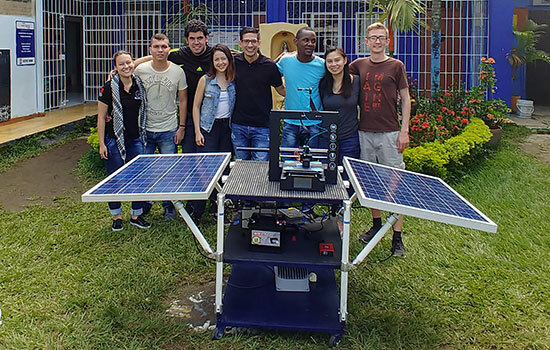 Rochester Institute of Technology engineering students and faculty traveled to Cali, Colombia, on May 28 to deliver and show residents how to use a new solar-powered 3D printing system they developed. The team, overseen by Associate Professor Marcos Esterman, worked with partners from the Universidad Autónoma de Occidente (UAO) throughout the spring semester to create the product. Project organizers intend the venture to help residents of a Cali neighborhood at high risk of attracting youth to gang activities to develop marketable skills in advanced manufacturing. For their Multidisciplinary Senior Design course, six RIT electrical, industrial and mechanical engineering students created a versatile 3D printer power system that can seamlessly switch power sources for use in developing economies. The group collaborated remotely with UAO students who were tasked with simultaneously developing a way to use recycled plastic bottles as reinforcement in the 3D printing filament. This project marks the first step in an agreement RIT and UAO reached last fall. The agreement aims to develop student and faculty project and research exchanges focused on international product design theory and commercialization for developing economies. The project was spearheaded by Esterman and his former student Alvaro Rojas Arciniegas ’08, ’13 (industrial engineering, imaging science), who is now a faculty member at UAO. Esterman hopes to build on the initial project’s success and expand the partnership into a series of interrelated programs that will help undergraduate and graduate students from both schools gain design and development experience while making a broader social impact. 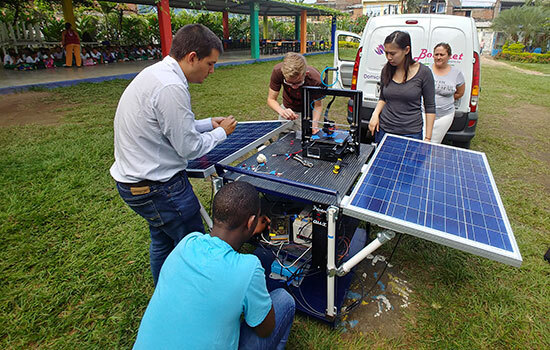 RIT with partners from the Universidad Autónoma De Occidente set up their solar-powered 3D printer.